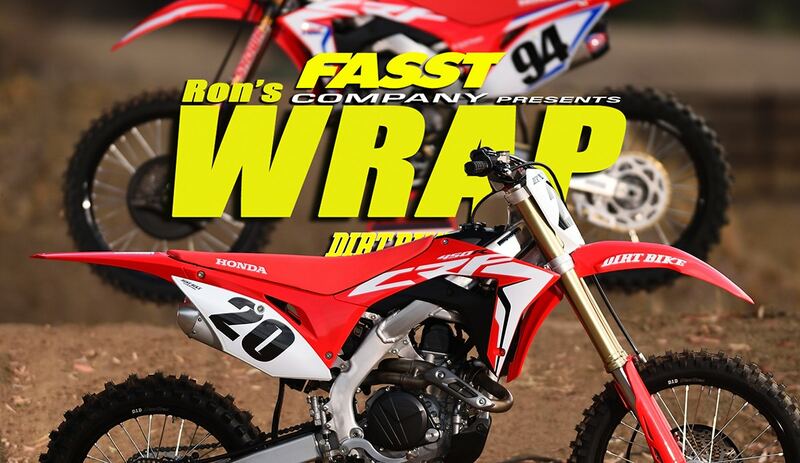 Last week, we got to ride the 2019 Honda CRF450R back-to-back with the new Works Edition. What we found surprised us. The WE isn’t exactly what we expected. For that matter, the standard 450 was a little surprising too. 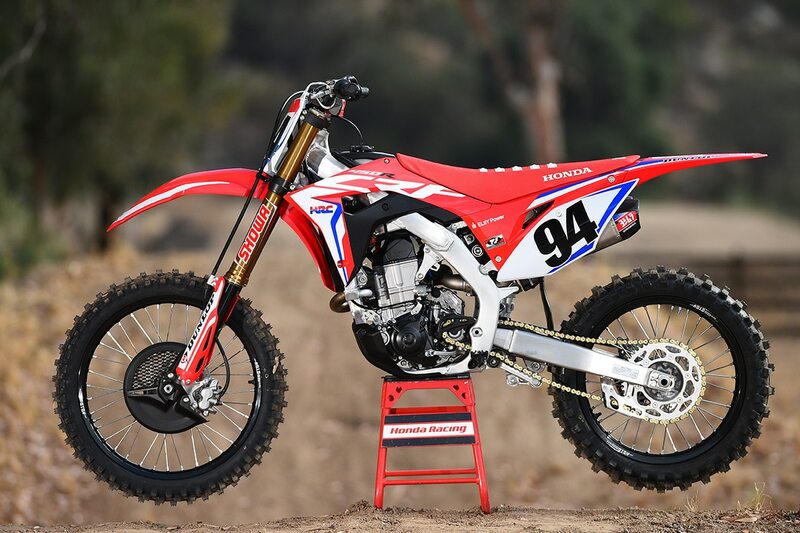 The 2019 Honda doesn’t look that different from the 2018 version, but Honda made some big changes. The engine cases are new (without the kickstarter boss), the frame is new (less rigid), the swingarm is new (also less rigid) and the mapping is different. Also, the bike now has launch control. 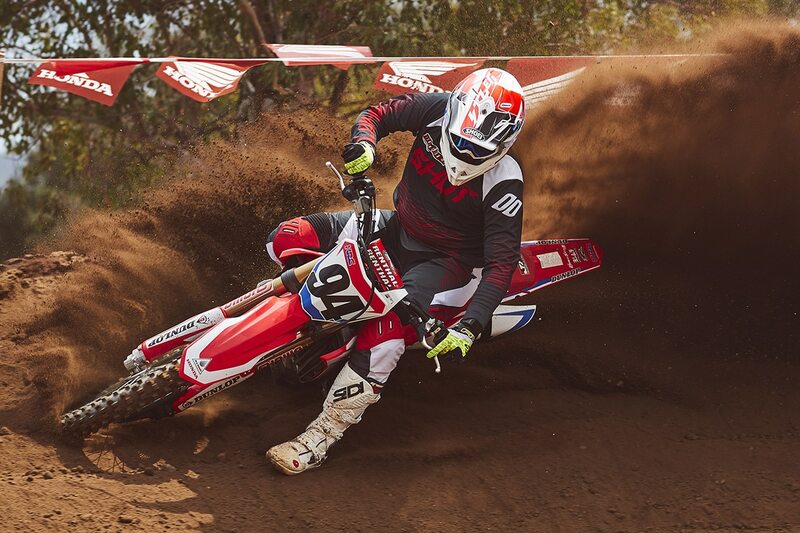 Justin Jones on the standard 2019 Honda CRF450R. If you’re a Honda guy, you’ll notice the changes right away. 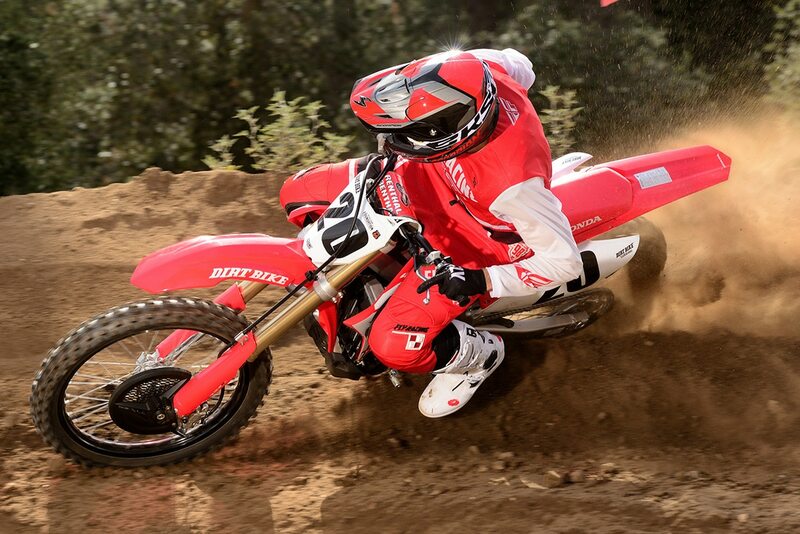 We had Justin Jones as one of our test riders, and he’s about as familiar with the previous Honda as anyone. He had absolutely no trouble spotting the changes. He felt that the bike was more comfortable and that the frame changes were a step in the right direction. He also pointed out that in the past,Honda riders generally learned to run more engine oil than the manual recommended to get the clutch to last. The new cases hold more oil, so that’s been corrected. The biggest change of all was power. The Honda gained a little everywhere. There are differences to the head, the pipe and the mapping that account for this. We say the Works Edition isn’t what we expected because we associate it with the KTM Factory Edition and the Husky Rockstar Edition. It’s actually a different concept. Those bikes are both previews of the next year’s model with a little extra bling. They don’t offer any performance increase over the bike to come. In Honda’s case, the differences are clearly performance driven. The head is hand-ported, the suspension has internal Kahima coatings and Ti Nitride on the tubes and the mapping is different. Like KTM, the Honda’s muffler is an upgrade–Yoshimura twin slip-ons, in this case. And like KTM, the graphics are a tribute to the company’s big star–Roczen, in this case. Mark Tilley on the Works Edition. Photo by Drew Ruiz. The power increase is undeniable. The Works Edition has more mid-range and top end. Between the power increase of the standard model and the Works Edition bonus, it might even be the class champion, power wise. That contest will have to wait. The most surprising difference of all was the fork. The two Showa coil spring forks have identical internals aside from the coating. They have the same valving, the same springs and everything. Yet they felt completely different. The WE’s fork moved much more quickly. It actually threw off all our settings at first. It went though the stroke so much more quickly that it felt harsh. When we increased both rebound and compression damping, it was much better. Don’t expect the same setting to work on the two bikes. The one omission on the WE is a hydraulic clutch like the one on Roczen’s real bike. That’s the one change that the average rider can’t buy, and one that the Honda desperately needs. 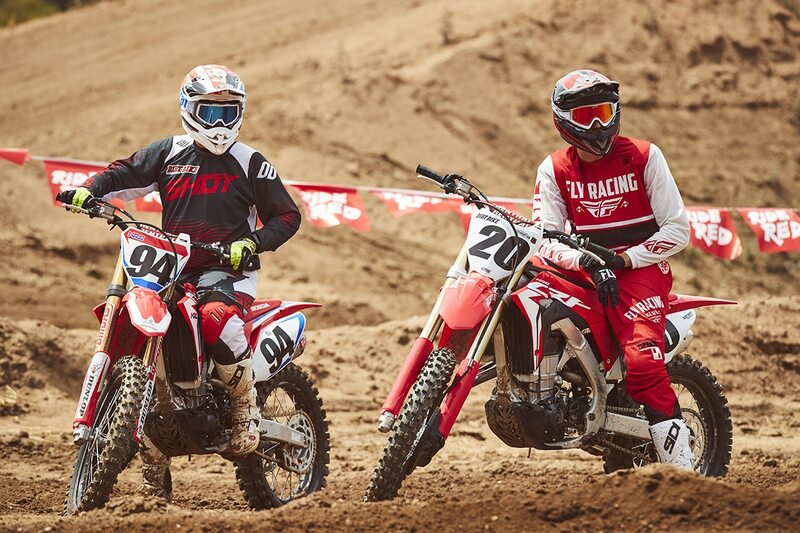 Mark Tilley and Justin Jones spent a day on the two bikes at Chaney Ranch. The big question, of course, is straight forward enough. 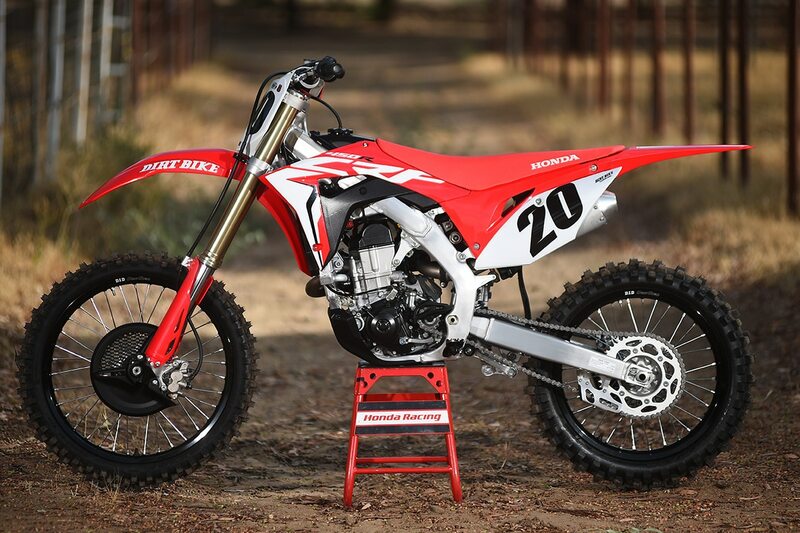 Is the CRF450RWE worth $2200 more? The WE is actually the most expensive MX bike available right now, surpassing even the KTM Factory Edition. Only 500 will be available, so dealers might even be asking more. If you price out the items individually, it all pencils out. The Yosh slip-ons are worth almost $1000, the suspension coatings are worth more than that and head porting can go from $250 to $1500. But are these the exact modifications you want? Most riders will want their own suspension work and their own graphics. In truth, the Works Edition isn’t for high-end pros planning on riding Nationals. Those guys ride highly modified bikes and they don’t want someone else deciding which modifications they run. It’s more for the older rider looking for a prestige bike. The same goes for the KTM Factory Edition. Look for the complete test in the October, 2018 print edition of Dirt Bike. 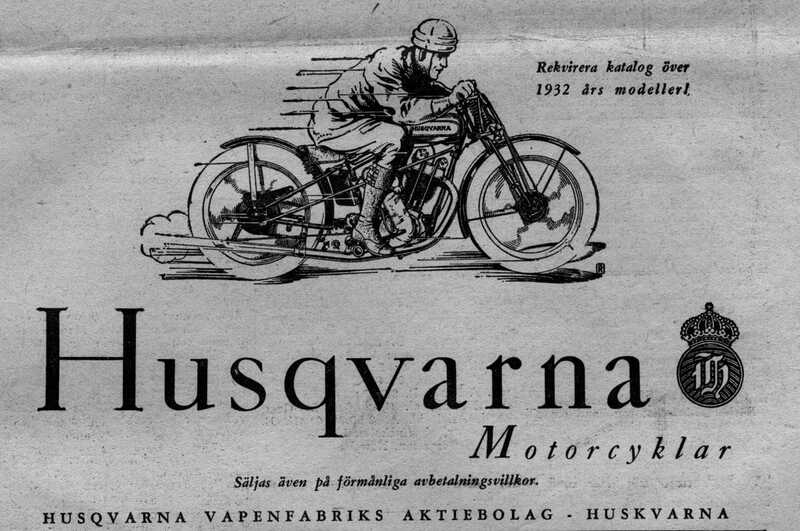 Kenneth Olausson puts together the Husky Good Old Times Blog, and he sent us a collection of old time ads that appeared mostly in Swedish publications. Some are fun to check out. You can read the whole story by clicking here.